Remember is one of those films that gets in your psyche and rewires some things to make you remember in the future. 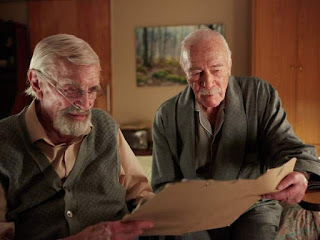 The film follows Zev Gutman, who is played by Christopher Plummer, as he is lead on a journey facilitated by a nursing home companion, Max, to kill a Nazi from their past. The film features an awe-inspiring performance by Christopher Plummer as we see his elderly character struggling with dementia in an outside world. After seeing a Nazi-era related film, I was hit at home by this thriller. The way that Max uses Zev to fulfill this mission is as risky as it is brilliant. Throughout the film, we see the environment of nursing homes and are reminded of Zev’s escape from the tiredness there. I noticed how the guide, Max, was in a wheelchair but had all of his mental capacity. It was a thoughtful connection to have Max be guiding Zev, who was able to walk but again had dementia. One sees Max by the phone which is his sole way to operate the mission and you feel a sense of need by his character. When I first saw Zev step out of the residency and take a taxi, I felt very concerned for him. Yes, this is a fictional movie of course and not a documentary. It is incredible where Plummer’s Zev goes throughout the film and the cinematography that is captured with that. He even crosses country lines in and out of Canada. With his multiple episodes of dementia, Zev is kept alive by a letter that Max has thoroughly written. As an audience, we feel a sense of care between the friends. There is a scene of misunderstanding that hurts and presses my heart. It is one where Zev pulls out a gun on someone that he thinks is the Nazi he’s looking for. It turns out that this frail person lying flat and who can barely talk is a homosexual from a camp. The man shows him his arm containing prisoner numbers and Zev cries in the bed in one of the most powerful scenes in the film. Plummer has a fantastic sense of emotion that is amplified only sometimes in the story. We are at another time reminded of just how frightening current hatred can get. Dean Norris brilliantly and terribly portrays this in a scene that turns from good to outright evil. Remember is certainly a thriller that has us visit needed areas of our minds. The movie is R-rated (threatened violence and understanding of concentration camps), so expect some tension, very little profanity, no blowie uppie stuff and limited gun play. Our screening audience was vocal and excited as we exited the theater. I AM Jay Lane. It's interesting to see excerpts of my reviews scattered around the Internet.